The first picture is 1 1/2 inch strips and strip sets. The second picture is one of the 9-patches. see the quarter for sizing. This is 2 inches. The pattern is made of double 9-patches and shoo fly blocks. As you can tell, this may take me awhile. I may have lost my mind. LOL. One thing I do know, is that I am having to be very precise on the cutting and sewing. There is no room for error. Of course I do love the challenge. 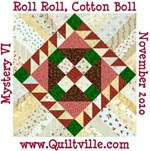 I am collecting fabrics for another quilt. Polka dots. 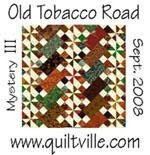 A few months ago Vicki Perry's mother did a trunk show at Greater Columbia Quilters. She had a Piece O Cake quilt that I loved. It is called "Completely Dottie" . You may have to wait awhile for this one. LOL. I maybe about caught up on this blogging thing. YES-I think you have lost your mind!!! Can't wait to see it when it's finished! Omigosh is right! So many, many pieces. But it'll be gorgeous when it's finished. ooough this is gonna be awesome! 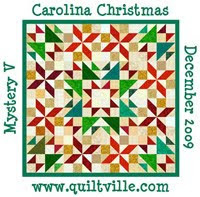 I recently purchased this pattern too - they were set up at a table when I went to my first ever Quilt Guild meeting and when I saw it - it was love at first sight. unlike the pattern, my mini 9-patches will not be scrappy but all 5 color patches be of the same fabric - b/c a couple years back I hosted an ongoing mini 9 patch swap and I have over 800 of those cute little boogers! I'll share a link from my blog with you - of where I posted about my mini 9's ... somewhere in there I shared some useful tips on how to go about getting them to be perfect. I found that using just a tad bit bigger and then trimming worked best for me. how big are the churn dash blocks?? 1.5 inch finished 9 patches sound so TINY! !